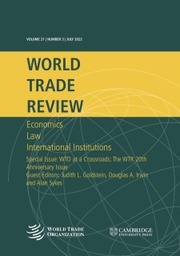 The World Trade Review was established at the initiative of the Secretariat of the World Trade Organization (WTO) in close cooperation with Cambridge University Press. It is an independent journal - the Editor and all but one member of the Editorial Board are drawn from university faculties - that includes articles written from economic, legal, political and inter-disciplinary perspectives on issues of relevance to the multilateral trading system. Priority is given to papers that, along with being academically rigorous, are also accessible to government policy officials and the wider public. The journal also includes shorter articles seeking to rebut or challenge published papers. Indonesia–Chicken: Tensions between International Trade and Domestic Food Policies?